Ever felt the urge to feather your nest with a bird from the Psittaciformes order? (That's the parrot family to those non-Latin, non-Wikipedia speakers of you out there.) We adore these fascinating creatures - the proud curve of the beak, those bright beady eyes and, of course, their ability to vocalise! But (as with all things) we recommend thorough research and deep thought before finding your own special Polly and bringing her home. The first and possibly most important thing to know, if you don't already, is the little fact that having a parrot in the family means the bird may well out-live you. Large parrots can live for a good 40+ years and even up to 70 years or more. So you need to remember to leave them to someone in your will (take heed commitment-phobes!) and be sure that you, and your nearest and dearest, are ready for a whole lifetime of pampering Polly, so get started early with socialising her and bringing her truly into the family fold. Think big-picture from the start because you and your parrot are in it for the long-haul! As with any other species, different types of parrot look different (obviously), may require different food, and will behave differently to some extent. Macaws hail from South America, African Greys from, well, Africa, and Australian Cockatoos... well, you get the picture. Different species can vary greatly in temperament, noise-making, capacity for socialisation and quality, safe human interaction, and talking ability. Even disposition: Conures, Meyer's, some Macaws. Very playful: Jardines, Conures, Meyer's, Budgerigars, Cockatiels, Caiques. Particularly loud: Cockatoos, Macaws, Conures, Amazons. Intelligent and sensitive to their environment: African Greys. That said, the way you raise and teach Polly also plays a big part in her ultimately character and personality make-up, regardless of species, which, if you haven't got the point already, implies all the commitment (again) and devotion required from you to have a happy birdy home, for your sake and Polly's. The size of your home and the space you have for a parrot should help inform you with regard to which type of bird is most suitable for you and your family. Polly needs a cage large enough to allow her to fully spread her wings and move about comfortably in it, and indeed to be able to play around a bit, which includes a lot of climbing and chewing (and the various toys which help her do that), eating, pooing, and generally feeling a sense of roominess in there. Added bonus: a perch or play "gym" outside the cage for working off some of that wild parrot energy. Even better, frankly, is the regular opportunity to not only get out of the cage and into the "gym", but to get around the house and interact with the entire environment - these birds, especially the bigger ones, really are bright and need a lot of interesting things to do and close, meaningful connections with other living beings (human or otherwise) to keep them happy and fulfilled. Oh, and by the way, be aware that parrots (in fact all birds) are highly sensitive to fumes/gases, so their cage needs to be in a well-aired spot away from cooking and definitely NOT in a garage where your car might be running for some time - though, as you know, most of us in Dubai part... and live!... outdoors most of the time anyway. Also, be wary of ongoing draughts or direct sunlight - you wouldn't like that either, would you. 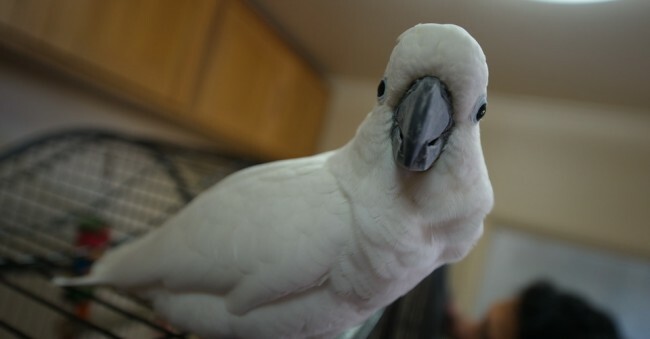 Speaking of getting out of the cage and, hopefully, around and about your home, you need to think quite seriously over the question of whether or not the clip your bird's wings, or more accurately, your bird's wing feathers. This is a simple thing to do (for someone who knows what they're doing, of course!) and does not in any way hurt Polly - it involves clipping, or trimming down, certain of her flight feathers so that she cannot fly any kind of distance (such as around your house or, terror of terrors, out of your home and into the wild, never to be seen again) but also so that she has enough of those feathers remaining so that if she jumps from somewhere (yes, they do that!) or falls, she can flap her wings and float gently to the ground without hurting herself. Now, on the face of it, this seems like a good thing to do, clipping her wings, so why do you need to think about it? Well, some people believe that clipping the wings is the right thing to do (or, at least, not a wrong thing to do) because it keeps Polly close to home and safe. Others, however, think that clipping a bird's wings and removing her ability to fly is like removing the claws of a cat or the legs of a human - flight is so fundamental to birds that, these people feel, taking flight away seems to go too far in our wish to domesticate birds and keep them as pets. Are there windows or doors she might fly through and thereby escape? Remember that these birds will likely find it difficult to survive in the wild because they were not born in the wild. Are there particular areas in your home that you would rather her not enter? How will you manage that? This is not to say that you cannot have her sometimes in the cage and sometimes out of the cage - of course you can - but in the end, if you want to let her fly, she will have much more mobility and this will require some thinking on your part. In Picky Parrots we explain why, as wild birds, parrots need visual stimulus for their food. Also that they're not actually predominately seed eaters(surprised, right?). Best for them is quality protein, vitamin A vegetables, other vegetables and fruits, whole grains and carbohydrates, and lots of calcium (a parrot's most important mineral) and only 5-10% seeds (no rhubarb or avocado - poisonous to birds!). Don't buy on impulse. Try to work out expenses beforehand and, more importantly than anything, ruminate over the commitment and the very strong potential for change in lifestyle, to some extent. Parrots can be trained but are not naturally domesticated like cats and dogs. They are often brilliantly intelligent and surprisingly intimately connected with their loving owners, and so exactly because they are "wild" animals, that intimacy can be tremendously fulfilling. But do give it some thought for the sake of your happiness and theirs. And then, if you're ready, go have a squawking good time, for a good loooooong time, with your fine feathered friend!